Whether an individual or an organization or a group or a society, those who squander away what they have, have never grown wealthier. This is true for governments too but they are the ones who most forget this basic principle. Ideally, they should be working within our means but they have worked beyond means, leading to a very large fiscal deficit. How well the government has performed in terms of work done per unit of tax collected is difficult to measure but that is not even necessary if we agree that whatever they do, they have to do within a limited part of what the citizens earn. When the government is fiscally imprudent, it affects the poor more than the rich because the cost of living shoots up with additional tax on every transaction. So how fiscally prudent has the Government of India been? This is what our last Saturday Poll asked you. 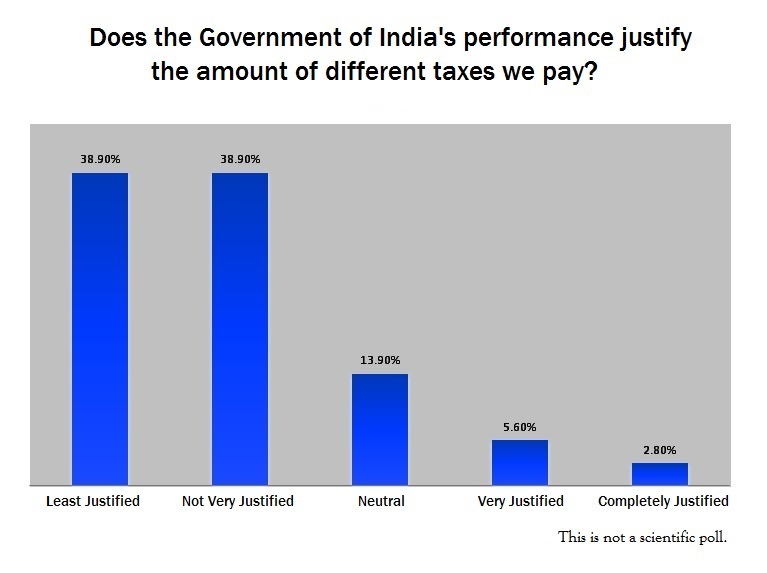 38.9 % of said you were least satisfied with the performance of the government in light of the price we pay, while only 1 of our 35 poll takers said they were completely satisfied with the government’s performance. The average score accorded on a scale of 1 to 5 where 1 shows least justification for the revenue collected from citizens and 5 shows complete justification for the fiscal policy is 1.94. There are many differing opinions on taxation across the world but an accepted notion among economists and tax experts is the excessive complexity of the Indian taxation model owing to many indirect taxes with a cascading effect of multiple taxes on goods and services. This not only affects the cost of these products and burns a hole in the consumer’s pocket but also increases the compliance cost. The effect is increasing cost of everyday products for the common man irrespective of their being rich or poor. When this already large burden is further worsened by ill-advised spending by the state, the repercussions are worst felt by the lowest rungs of the economic strata. Crores of rupees have been expended in trying to keep many bankrupt government enterprises such as BSNL, Air India and MTNL afloat apart from the large revenue share that is swallowed by corruption within the system. Their estimated loss is Rs.65,649 crore in the past three years which is equal to losing Rs.75 crore ($12.48 million) a day! Most fiscal crisis in India have been attributed to the lack of attention paid to availability of resources before investing them. Crores of rupees have been expended in trying to keep many bankrupt government enterprises such as BSNL, Air India and MTNL afloat apart from the large revenue share that is swallowed by corruption within the system. Their estimated loss is Rs.65,649 crore in the past three years which is equal to losing Rs.75 crore ($12.48 million) a day! Such irrational expenditure can only be sustained by further taxing citizens who do not reap any benefits from these PSUs. The impact of targeted benefits too is lessened in turn due to rising prices. So how have we dealt with this issue so far? Necessity is the mother of all invention has been the dictum that has guided all efforts at reforming India’s taxation policy through history. There have been many committees constituted to suggest tax reforms in India such as the Kaldor Committee, Boothalingam Committee and the K N Wanchoo Committee. While these focused on increasing the taxation base, the Tax Reforms Committee headed by Raja Chelliah was the first to suggest that customs, excise and corporate taxes be drastically reduced allowing market forces to decide resource allocation in the country. In order to better understand his argument, let us consider this scenario- the state reduces taxes on its citizens by half. People now have more money to spend including employers. They can now employ more people. More people earn income and sustain households. They in turn have more money to themselves and can spend more. This increased spending allows for cyclic innovation, growth and would logically set the economy on a sustainable upward trend. People are now empowered and independent rather than living off subsidies from the state that cannot be sustained in the long run without unfairly burdening tax payers. After all, every person has the right to live a life of dignity and one cannot take that opportunity away from them even if it is being replaced by benevolence. No government has the right to rob people of their hard earned money unjustifiably. India in fact enacted the Fiscal Responsibility and Budget Management Act in 2003 that aimed to bring down the fiscal deficit to 3% of the GDP by March 2008. Unfortunately, though, the international financial crisis of 2007 became an excuse to suspend its implementation. In the report on Fiscal Responsibility by the Prime Minister’s Economic Advisory Council, the Government has been advised to consider reinstituting this Act during the ongoing recovery process owing to its stress on financial discipline and a balanced budget. This new financial year is starting with the general elections and manifestos of all the parties promise several tax reforms. But none that can be honestly implemented to reduce the total amount of tax a citizen pays. Because all of them are also making tall popular promises, even half of which cannot be delivered without burdening the taxpayer. And that is a promise that whoever we elect, our hard earned money will be squandered away. The poll referred to in the third paragraph is our Saturday Poll 23 that was posted on our social media on 29th March 2014.